A brief deliberation set the party's direction north, through the marshland, to see what else they might uncover in the forest. The morning fog gave way to a dark, looming canopy overhead as they entered the Witherwood, a subtle rain barely permeating its thick boughs. The trees, brush, and fauna all seemed normal, and the party observed no signs of disease. When finally they began to set a fireless camp after hours of roving through dense and uneven terrain, Merlin alerted the group to a lifeless, bloodstained gnoll slumped against the trunk of a think oak. In the dim twilight the party noted the same pockmarks and boils that infested the stag they'd encountered with Roth-grim, two days hence. They dared not draw near, ensuring that their campsite was kept at a suitable distance. During the night, sounds of creatures traipsing through the wood prompted Wren and Riwyn to ascend into the low branches of nearby trees while Arendeth and Aranos took guarded positions on the ground, blind but for the dwarf's infravision. 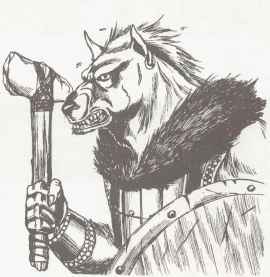 When the movement slowed and veered toward them, the PCs readied themselves for battle, ere a pair of dog-faced gnolls attacked, wounding Aranos before knowing their demise. The next day, the party meandered east, then turned south, successfully avoiding more gnolls spotted by Merlin, and discovering a copse of corroded trees, likely damaged by something resembling acid. At dusk, they neared the edge of the marsh and again set their camp. Upon waking and reentering the marsh, disaster struck: quite suddenly, as the PCs made their way through the tedious wetlands, they became aware of hulking, frog-like forms situated around them on all sides. 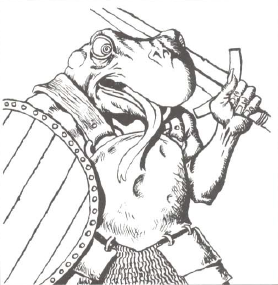 Exchanging wary glances, the companions ran back toward the wood, but the frog-creatures pounced, driving crude metal implements at the party with severe force and outpacing their quarry effortlessly. Aranos was impaled and fell face-first into the murky ground; the remaining party members stood fast, swinging and slashing with all the deftness they could muster at the half-dozen bullywugs assailing them, but the numbers favored their enemies and Riwyn fell, then Wren, with only a single frog-man laid low in return. In a rare instance of good fortune, Arendeth evaded the attackers long enough to cast hold person, magically paralyzing two of the remaining five. As the melee wore on, the dwarf splattered two more bullywugs amid the marsh, ere the final mobile enemy took flight. Racing against time, Arendeth cast cure light wounds on Aranos, then Riwyn, then Wren, mere moments each from breathing their last. The dwarf urged his companions to flee while slaying the first paralyzed frog-man before hold person expired. The last bullywug, free of its magical bindings but finding itself face-to-face with the dwarf whose morning star had crushed four of its allies, leapt backward and disappeared into the swamp. Arendeth ushered his companions, feverish and barely able to move, into the forest, allowing them to rest. No creatures happened upon them for the remainder of the day or night, but in the early morning hours a larger platoon of bullywugs began milling about the location of the previous day's encounter. Arendeth led the party away, skirting the edge of the marshland but wading further into the tree cover. When no enemies followed, the dwarf was at liberty to regain spells, which he applied generously to his allies, restoring them to able statuses. Half the day already passed, they continued their trek south, arriving at the trail that led to the crossroads at nightfall. They marched west, toward the fiefdom, spying a mounted rider. Hiding in the woods, Arendeth cast hold person at the steed's approach, but seeing that the rider was indeed a Brithem soldier, the dwarf released his spell and the party returned to Brithem in the dead of night. The numbers don't align exactly to the combat rounds (because that's not how I track damage), but the black 1s at the bottom mark the rounds of the hold person spell, and the red 1s in the character rows mark the "death's door" damage incurred in the rounds after falling unconscious. As it was, Aranos dropped to 0 and gradually fell to -9 before being healed during the last possible round by Arendeth. Riwyn and Wren each dropped to -1 and fell to -9 and -8, respectively, before being healed. The three consecutive castings of cure light wounds by Arendeth left the dwarf with only a single round to deal with the two magically-held bullywugs, during which he executed a coup de gras to slay one. If the only action is to bind the wounds, the injured character no longer loses one hit point each round, but neither does he gain any. He remains unconscious and vulnerable to damage from further attacks. If a cure spell of some type is cast upon him, the character is immediately restored to 1 hit point—no more. Further cures do the character no good until he has had at least one day of rest. Until such time, he is weak and feeble, unable to fight and barely able to move. He must stop and rest often, can't cast spells (the shock of near death has wiped them from his mind), and is generally confused and feverish. He is able to move and can hold somewhat disjointed conversations, and that's it. For the sake of consistency, I'll adjudicate this more closely in the future. In previous games I may not have erased spells from a character's mind, etc. Going forward I'll try to stick to the book. I don't want to lose sight, in all the above, of how directionless the party was in rummaging through the forest. The players all knew this, so it's not like it was any kind of secret, but I think the end of the adventure drove home how treacherous their foray really was, lacking sufficient resources or a solid plan. It's certainly possible that they'd have found something more meaningful given a little luck, and I'll also add that Merlin goes a long way toward supplementing the absence of a tracker, having the ability to survey the group's surroundings at a wide radius. Those things said, in the end, the party's success or failure in investigating the Witherwood was left more to chance than anyone probably desired. The luck of the dice will always play a role in any D&D session; such is the nature of the fantasy world when we play. But one of the core tenets of a successful D&D party should always be to minimize the luck factor as much as possible, through proper planning and the use of resources, be they items, information, hirelings, familiars, etc. I wouldn't typically divvy out experience at this point since no major milestone was achieved, but given the party's uncertainty about continuing its present course, I think it best to do it now. Shares have been divided up and added to the totals on the site. I'll need some idea of the party's plans before the next time we play, as there was much hesitation at the notion of returning again to the Witherwood, or even venturing elsewhere to gather more resources for Brithem. Feel free to discuss your options in the comments or separately offline. In any case, I'll want to know the group's intentions about a week or so out from the next session, once it's scheduled.